The Thigh Bone Is Connected To The Shin Bone, The Shin Bone…..
My last post, The Hip Bone Connected To The Thigh Bone….. , started a discussion about systems, that is how things work, interrelate, and the dependencies they have on each other. I focused specifically on how we acquire and retain customers, focusing on sales and marketing as separate, but tightly related systems. Changes we make in components of our marketing systems impact the overall marketing system and impact the corresponding sales systems — and vice versa. For example, if we gear up a major new sales prospecting initiative to acquire new customers in a certain market segment, but we don’t have the corresponding marketing programs to support the sales initiative, we will probably not achieve our goals. 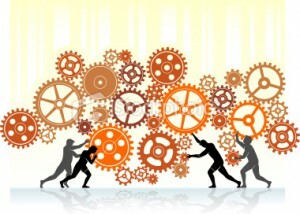 Now let’s turn the crank one more time and look at the new world of buying, selling, customer and community interactions. After all, our marketing and selling systems exist only to serve the customer’s need to buy and their buying system. There is no purpose for sales and marketing without this. Let’s start with customer buying — after all, they need to be at the center of things. From our own points of view, we tend to overlook customer have many interlinking systems and processes they must manage within their own organization to “buy.” They have to align different functions, people, agenda’s, goals, requirements to make the best decision for their organizations. It’s very difficult and complex. However, I’ll hold on that discussion for a much later date. For the purposes of this article, let me focus on the systems that interface with the customers buying decisions and how they are connected. In the “old days, ” It used to be our marketing and selling processes and systems were oriented to creating awareness, interest, demand, need and fulfilling a buying requirement for a customer. Our marketing and sales systems were oriented around informing and educating prospective customers. In fact, our customers depended on us, and our competition, to do this well, so they could evaluate and purchase the right solution. Sometimes there were outside things — like those pesky anaylsts–that helped to inform the customer about our products and those of the competition. But we accommodated those in our marketing and selling systems. Some how this model of buying and selling was very efficient and worked for decades. However, the world of buying is changing rapdiley and profoundly. This thing called “social media” one of the things that has turned the world of buying upside down. Buyers are no longer depending on our sales and marketing–or that of our competition–to be informed and educated about solutions. Buyers are using communities of users, other informed people, and even those with an axe to grind for their information on trends, issues and solutions. They are engaging communities of associates around the world, learning about their experiences with those products and solutions. Customers changing the way they buy, changing their “system” in ways that are “designing” our sales and marketing efforts out of the process—or at least significantly redesigning our roles. They are moving quite aggressively, relying on what they perceive as better sources of insight through communities on the web. As you may recall from my last article, not only are the customers changing the way they buy, they are changing their “interface definitions.” Remember, the value of common interfaces helps ease the challenge of optimizing systems. If we keep the interface definitions constant, we can re-design the systems on either side of the interface. Once the interface changes, everything on both sides has to change. It’s this “interface” change that creates one of the greatest challenges for us. It mandates we change the way we design our marketing and sales systems. Yet too often, we continue, somewhat wishfully or wistfully, with the way we always used to do things. We wonder why our marketing and sales programs are no longer producing the result they used to. The new “interfaces” are being defined. Our customers are doing this now by redefining the way they buy. Sales and marketing needs to claim a place at that table–both responding to the new interfaces the customer is designing and advising the customer on more effective and efficient buying process design. We need to redesign our sales and marketing systems to accommodate these new interface and systems. There are new participants in the system–communities of up to thousands that all have some impact on the way the system works. Some have strong interactions, some are much weaker. We need to understand these new participants in the systems and make sure our systems work with them. I’ll stop here. Perhaps I’ve been a little long winded in my explanation, but we can no longer be designing how we market and sell by focusing on our own organizations and functions. The customer has always been a major part of the design, but there are new players we need to include in our thinking. If we don’t someone else might–making their system much more effective. I don’t know if I can any more clear then you are, it is a very complicated subject which makes rambling quite common. What I have found interesting with this subject when working on it in our company is about how everything flows together. You have the marketing department, the sales department, the IT-department and back office. If everything doesn’t work in tandem nothing works. Marketing is what we present to the public and build an interest in us. The Sales Department are the ones who take the customers from mild interest to purchase decision. The IT-department is our product creater and if that doesn’t work everything falls. Back office is in charge of handling complaints, customer service and billing. As you can see. If any of these says something else then the others, everything will fall. If the marketing doesn’t picture the product, people will be confused, if the salesmen push for a solution and use the great customer service as an argument whilst are back office sees customer service as second tier importance, the customers will be disappointed. Everything must work and even more importantly work together to create value to the customers, to the company and to everyone in it. This is my take of processes, systems and building a company seen in pretty simple components. Thanks for helping clarify my thoughts Daniel. One of the points I am trying to make–but struggling with—is our companies don’t exist in isolation and are interconnected with our communities, customers, and our competitors. We tend to develop our systems and processes from our own point of view in somewhat isolated frameworks. We ignore, particularly in the “community” the impact of those systems and processes on our own design. I’m still struggling, but together we’ll get there. Thanks for helping–knew I could count on you! I think it is Cotler in principals of marketing that discusses this, out macro environment with great detail. The book is VERY long but definitely worth a read if you haven’t already, it might help you further the clarification.